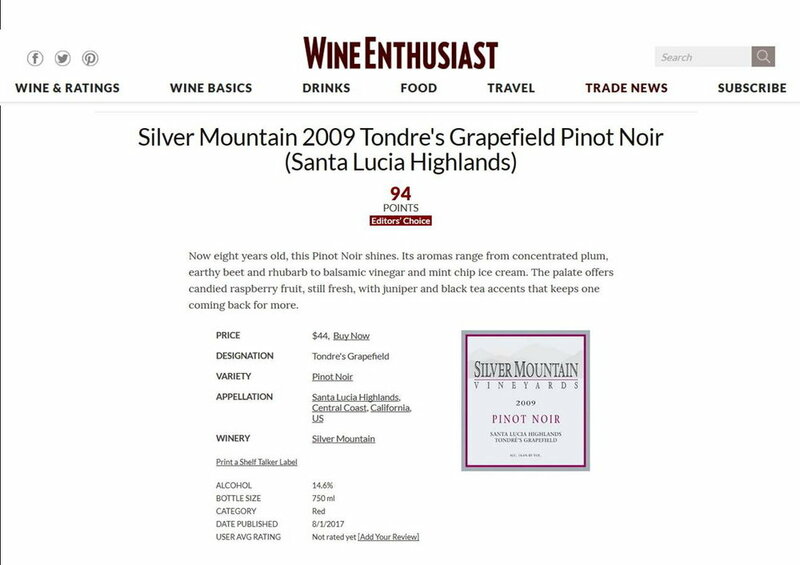 The 2009 Tondre Grapefield Pinot Noir garners 94 points and Editor's Choice from Wine Enthusiast Magazine! Says Matt Kellerman, wine reviewer: " Now eight years old, this Pinot Noir shines. Its aromas range from concentrated plum, earthy beet and rhubarb to balsamic vinegar and mint chip ice cream. The palate offers candied raspberry fruit, still fresh, with juniper and black tea accents that keeps one coming back for more. " See the review here. Wine Enthusiast, 1 August, 2017. Jerold O'Brien's philosophy is to be a good steward of the land. Here is an excellent Stewardship Profile on Jerold on the American Farmland Trust website. "Jerold O'Brien is proud of his “triple green” conservation practices: water harvesting, use of solar and wind energy, and certified organic production. Part of Jerold’s stewardship philosophy is to “know your land.” Read the full Profile here. Jerold O'Brien and Silver Mountain in Bin Notes: "His winery sits atop the sandstone-laden San Andreas Fault, within view of the North Pacific plate. O’Brien’s unfortunate proximity to both fault lines proved fateful when he lost the first winery and three years of production in the 1989 earthquake. Rebuilding post-earthquake... Silver Mountain Vineyards now boasts one of the largest solar arrays in the Santa Cruz Mountains, an extensive rain water-collection system, shaded area to reduce storage, and an artificial cave for barrel storage. O’Brien contends it may be the most sustainable winery in the area. O’Brien insists upon practicing organic farming, earning CCOF certification in 1991 for his efforts. Today, Silver Mountain Vineyards produces award-winning estate and single-vineyard sourced, small-lot Burgundy-inspired wines – plus private, premium label winemaking for a few high-quality wine growers in the region." Read the full profile here. 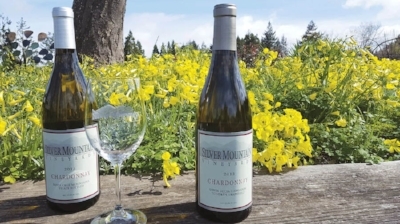 "Organic Legacy of Silver Mountain Vineyards, Santa Cruz Mountains Chardonnay carries on a long legacy of organically farmed grapes" in Good Times Santa Cruz, 28 March, 2017, by Josie Cowden. "The 2013 Chardonnay Santa Cruz Mountains is all estate-grown and bottled, and made in the style of French Burgundy “to showcase our estate vineyard,” says Jerold O’Brien. “The Mount Eden clone is rich in flavor, and hearkens back to Martin Ray and the early days in the Santa Cruz Mountains,” he says of planting his vines a long time ago. And with three decades of experience under his belt, O’Brien certainly knows his vines and his wines. He produces some fabulous Chardonnays—the estate 2013 being no exception. Elegant and complex, it has a beautiful nose of vanilla and citrus peel, with subtle aromas of minerals, pineapple, yellow apple, and delicate herbs. On the palate, this zesty wine is citrusy, creamy and refreshing." Read the story here. "Jerold O'Brien: Commitment to Community and Sustainability at Silver Mountain Vineyards", Los Gatos Living Magazine, October, 2017. "Winery Finds the Silver Lining" in the Wine Institute's Down to Earth newsletter on sustainable practices, November, 2016. "With its secluded mountain setting and dramatic views of Monterey Bay, Silver Mountain Vineyards lures wine lovers who appreciate the site’s natural beauty. But the visitors who come to picnic there and sip founder Jerold O’Brien’s Chardonnay and Pinot Noir may not know that O’Brien was a sustainability pioneer. A California native, O’Brien says his commitment to an earth-friendly lifestyle emerged long before he could put a name to it." Silver Mountain in Good Times Santa Cruz, 20 January, 2016, by Josie Cowden: "...when O’Brien says that he is “a leader in organic and sustainable practices,” he is putting it mildly. His was one of the first certified organic vineyards, long before the word organic was ubiquitous. The 2012 Santa Cruz Mountains estate-bottled Pinot is particularly robust and complex ($42). Made from organic grapes... this impressive crimson beauty is bursting with lush strawberries and cherries, with an aromatic layer of characteristic earthiness. It’s perfect to pair with veal, pork or a hearty steak." See the full story here. "The Land of Silver Mountain - A Sustainable Jewel", Business Air Magazine, Feb. 2015. "A Sustainable Jewel", by Mary Lindsay, Vino Magazine, Spring/Summer 2014. "Chardonnay in Balance" in the Huffington Post, 27 August, 2013, by Mary Orlin: “We are much more interesting than other regions,” says owner and winemaker Jerold O’Brien. Sitting at an elevation of 2100 feet, with panoramas of the Santa Cruz Mountains, he’s certainly got many beat with just the views.... With luck you’ll find Jerold at the tasting room when it is open to the public on Saturdays. A super nice guy, without a doubt one of the true characters of the Santa Cruz Mountains, making wine his own way." See the full story here. “Syrah 2007: A desirable red wine for Valentine’s Day” , by Josie Cowden, Santa Cruz Good Times, 12 February, 2013. “Epicure. On Silver Mountain.” By Christina Waters, Santa Cruz Weekly, May 19, 2010. “Discover: Surf City Vintners” By Mary Lindsay, Vine Times, June/July, 2010. Akeena Solar Converts Silver Mountain Vineyards to 100 Percent Solar Energy: Press Release, July 1, 2009. Also see story on SolarServer.com. Pinot File, March 2009. The Prince of Pinot reviews Santa Cruz Mts. Pinots and Silver Mountain’s 2006 Miller Hill, Muns Vineyard and Tondre Pinots. "The three Silver Mountain Pinot Noirs reviewed below were sampled at the winery in early February 2009 and at the World of Pinot Noir in early March 2009. All the wines showed excellent tannin management with structure and tannin evident, but not in any way imposing." See the details here. Celebrating 30 Years of Fine Wine in the Santa Cruz Mountains, Mountain Network News, January 2009. Feature on Jerold O’Brien and Silver Mountain, Touring & Tasting Magazine, Spring/Summer 2009. "Jerold O’Brien is happy to share the fruits of his labors. Wine tourers are particularly encouraged to come celebrate Silver Mountain’s thirtieth anniversary this year, on the winery’s high ridge with spectacular panoramic views of Monterey Bay, redwood forests, awe-inspiring sunsets, and, of course, premier wines of 3 rich flavor and layered complexity." See the full story here. Silver Mountain in Environmental Leader, 6 July, 2009: Silver Mountain Vineyards, a certified organic vineyard and winery in the Santa Cruz Mountains has joined the small but growing ranks of California growers and wineries to install solar systems to power their operations. The newly installed 46-kilowatt solar system will generate 100 percent of the winery’s electricity needs. See the full story here.